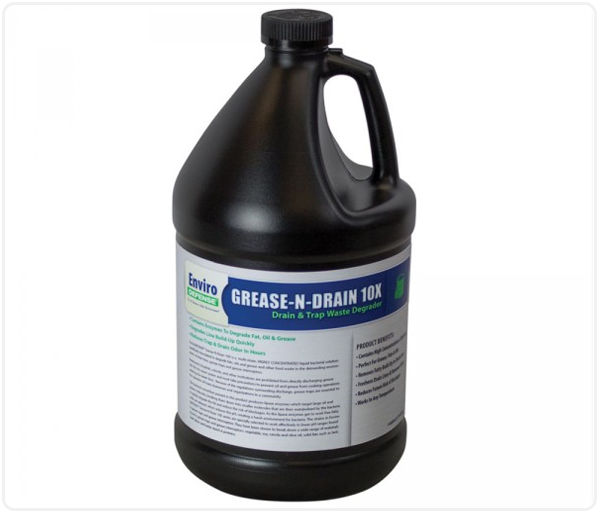 EnviroDEFENSE® Grease-N-Drain 10X CONCENTRATE is a pre-stabilized liquid bacteria and enzyme with odor counteractants. This environmentally sound and biodegradable product when added into a typical drain system will break the organic material into water-soluble nutrients. The released nutrients are digested by the select bacteria, which multiply and produce more enzymes to continue cleaning the entire waste system. This process digests wastes which keeps blockages from reoccurring downstream. 10x formula dilute 9:1, tap water to Grease-N-Drain 10x. Cellulase: Digestion of Cellulosic Particles. Lipase: Digestion of Fats & Oils. Grease Trap Application: 16 oz. (29.57 ml) for every 1,000 gallons (3,785 L) of tank volume once A week. Drain Application: 16 oz. (29.57 ml) for each drain needing treatment for slow running drains. Wastewater Application: 6 gallons (22.71 L) per day for every 500,000 gallons (1.89 million L) of flow.